In Rio 2 we find Blu, Jewel and their three kids living the perfect domesticated life in that magical city. When Jewel decides the kids need to learn to live like real birds, she insists the family venture into the Amazon. As Blu tries to fit in with his new neighbors, he worries he may lose Jewel and the kids to the call of the wild. Download Rio 2 in Digital HD from the iTunes store. Rio 2 images are © 20th Century Fox. All Rights Reserved. 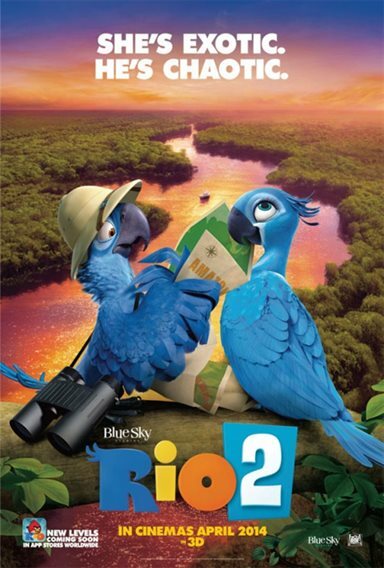 Rio 2 once again takes us on an adventure with Blu, voiced by Jessie Eisenberg (The Social Network), the rare blue macaw who is on the verge of extinction. Blu lives with his love, Jewel, voiced by Anne Hathaway (Les Miserables), and their three children. They have a happy life at the animal sanctuary in Rio complete with all the comforts of home and are completely "domesticated" much to Jewel's dismay. When a news story about Blu's owner, Linda voiced by Leslie Mann (The Bling Ring), appears on TV it peaks Blu's and Jewel's Interest. It seems the blue macaw may not be extinct after all, as Linda and Tulio, voiced by Rodrigo Santoro (300: Rise of an Empire), believe they have spotted other blue macaws in the jungles of the Amazon. When Jewel hears they may not be the last of their kind she is eager to head to the Amazon to see if the rumors are true. Joined by their friends Nico and Pedro, Jaime Foxx (Ray) and Will.i.am (The Black Eyed Peas), the Macaw family sets out for the Amazon jungle, a journey Blu is less than thrilled about making. When they reach their destination they not only find other macaws, they find Jewel's family who she thought perished when loggers destroyed their home. Introducing her children and husband to Jewel's Father, Eduardo, voiced by Andy Garcia (Oceans Thirteen), becomes a life-changing event for Jewel who wants to stay in the Amazon much to Blu's dismay. As a domesticated bird he isn't cut out for the jungle life and gets on the bad side of Eduardo. To complicate the situation there are loggers trying to cut down the amazon and crazy bird Nigel, Jermaine Clemente (Muppets most wanted), bent on revenge blaming Blu for his inability to ever fly again. 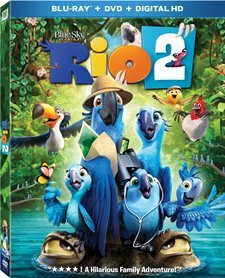 Rio 2 is presented in 2.40:1 aspect ratio with very sharp blacks, but often muted colors, which in a film with such vibrant characters tends to be a let down. The audio presented in lossless DTS-HD Master Audio 7.1 is superb. Your ears are treated to a plethora of music and sound effects that envelope the entire room. The Blu-ray extras include theatrical trailers, deleted scenes, a sing along version and a "behind the scenes" look at making the movie. The most interesting parts for me were the segments on music. The exploration of Brazilian music and the interesting way the performers came up with various sounds, from using their own bodies to everyday household items, was really unique. There was also a segment about the singers from Bruno Mars to Kristen Chenoweth and Will.i.am with Jamie Foxx. The extra feature where the animators were interviewed was kind of funny because they showed video of how the people brainstormed and all the dance moves they used for various character. Rio 2 is a cute, animated movie by Blue Sky studios that doesn't disappoint. It has some funny characters, and catchy tunes. A few of the songs left a little to be desired specially an operatic number sung by the incredibly talented Kristen Chenoweth (Glee) who plays Gabi, a lovesick and seemingly poisonous exotic frog who yearns for Nigel and will do anything to win his affection, including to help in the demise of Blu. The sequences showing the macaw's flight from Rio to the Amazon jungle was adorable and the portrayal of the jungle itself was beautifully animated with vibrant colors. The story is nothing new or special. A "fish out of water", "nobody will be good enough for my little girl", "Big, bad, Corporation destroying the rainforest" and of course, "good triumphs over evil" all play a role in the plot. However, you don't watch Rio 2 for great storylines. You watch it with your children and relish in their delight as they dance around to upbeat, South American rhythms. awww my niece loved the first one!